The Toll Canyon Open Space encompasses 781 acres and is under a conservation easement held by Utah Open Lands. The acquisition of this property was truly a community effort with numerous partners. The canyon provides opportunities for recreational trail connectivity, wildlife habitat enhancement and critical habitat protection. The “remote” feeling of Toll Canyon supports both nature and non-motorized recreation. 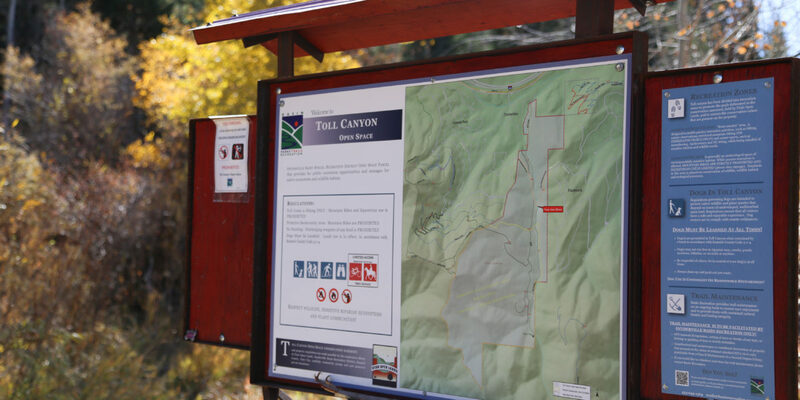 If you are new to Toll Canyon, please familiarize yourself with the posted allowed uses as many trails are dedicated for hiking only. Currently there are 2 main trails on the property: a 2-mile footpath in the center of the canyon along the perennial stream and a jeep road which allows hikers to access over 3 miles of moderate to difficult terrain and connect with the Summit Park trail network. Recreationists frequent Toll Canyon for year-round peace and quiet. Hiking, wildlife viewing and snowshoe/ ski touring are among the most popular uses. While construction of a trailhead is anticipated in the next couple of years, access from Summit Park and Pinebrook is currently very limited. Please obey posted parking regulations and be respectful of the neighborhoods. Street parking is not allowed from November 1 to May 15. There is no public access or parking in Timberline. Toll Creek Trail: This designated hiking-only trail is the most popular trail in the canyon. The Toll Creek Trail is a 2-mile long footpath that winds through the bottom of the canyon along a tranquil riparian area, dense forest and aspen groves. This riparian corridor is a vital part of the entire canyon ecosystem. Wildlife frequent the area along this trail so please keep dogs leashed and provide adequate space. Horses are not permitted. Moose Camp: This moderate trail has a difficult assent but is well worth the hike. A steep climb up the old jeep road will deliver you to a mile-long traverse through dense forest with the occasional alpine view. The Toll Creek Trail can easily be combined with the Moose Camp Trail to create a wonderful loop, extending the hike well over 3 miles. Hoof It! : Looking for a steep climb? Hoof It won’t disappoint. With grades that top-out at over 30%, you’ll “hoof it” for 1.5 miles to the top of this trail. Continue to Summit Slam, an additional half mile of trail within the adjacent Summit Park Open Space trail network, to reach Summit Park Peak and a view of Toll Canyon that is worth the effort.